Just a quick note to thank you for all your free designs through the years, they are very much appreciated. Would love to be able to use each and every one of those beautiful designs in this lifetime! I started on my Christmas gifts 2 weeks ago by spending Fridays in the sewing room. Have a set of Christmas-themed coasters and a couple of tote bags done already. 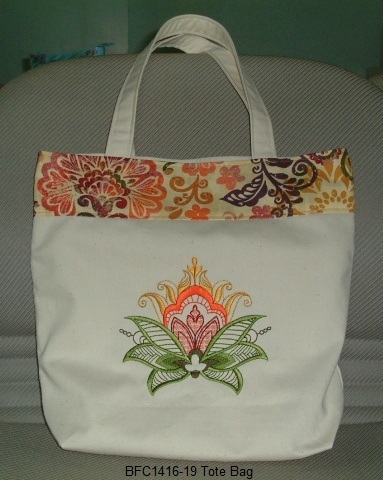 I embroidered a design from your 11th Anniversary Gift set (BFC1416-19) on one of the tote bags. The tote is made from Chino Drill and lined with medium-weight calico to hide the embroidery inside as well as to give the tote some body. Next Next post: A change of pace….